Visit Smashbox online at Smashbox.com which was founded in 1996 by Dean and Davis Factor, the great-grandsons of makeup legend, Max Factor, and owners of Smashbox Photo Studios in Los Angeles. Smashbox makeup is formulated to capture the effect of flawless studio lighting and meet the demanding needs of a photo shoot while still looking and feeling natural on the skin for everyday wear. Smashbox.com is a complete beauty destination, complete with their full line of best-selling products. Get the Look gallery and videos, makeup artist tips and tricks, Fashion Week Runway Report and more, all to educate, engage and entice. 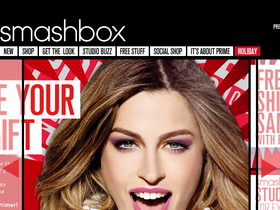 Save on your next Smashbox.com purchase with Smashbox.com discounts, Smashbox.com coupons, Smashbox.com promotions and Smashbox.com savings from 58Coupons.com. Sign up for the SmashBox.com newsletter and get $15 in discounts! Click link. Shop Smashbox.com and have your next order shipped for free. Click link! Shop at Smashbox.com to enjoy savings of up to 70% or more on Smashbox Makeup Kits. Save up to 50% on a huge selection of discounted Smashbox cosmetics at Smashbox.com. Click on Curtain Call. Save 20% on Your Purchase of $75 or More with this Coupon Code from Smashbox.com. Click Now and Save! Check out Smashbox.com on Tuesdays and Thursdays and you can get a free gift with your order. Click on "Let's Do Lunch" to get started.